Single-family and multifamily homes built in the previous ten years accounted for just 3.2 percent of the energy consumed in the U.S., according to NAHB’s latest analysis of data from the U.S. Energy Information Administration (EIA). EIA’s last report on ““Emissions of Greenhouse Gases in the United States” (covering data through 2009), shows that, in total (irrespective of when it was built), the residential sector overall accounted for 22 percent of energy consumption in the U.S. This includes “lost” energy that EIA allocates to the sector that ends up using electricity. In the residential sector, EIA’s current estimate is that 2.1 BTUs are lost in generation and transmission for every 1 BTU of electricity actually used in the home. 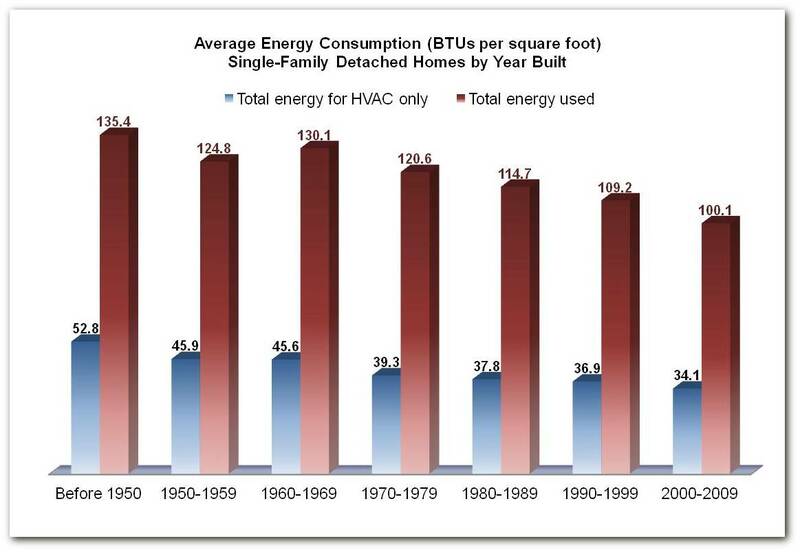 NAHB’s analysis used data from EIA’s most recent Residential Energy Consumption Survey (conducted in 2009, but not fully released until 2013), to break down residential energy consumption by structure type and when it was originally built. The result shows that, on a per square foot basis, the newer a single-family detached home is, the less energy it uses.